“Gun control” extremists like to make a lot of noise about how the Founding Fathers never could have “conceived” of firearms capable of the rates of fire achievable by modern examples, so the Second Amendment does not apply to them. Never mind that the same argument could be made concerning the First Amendment and the internet; instead, allow us to focus on the original argument itself. 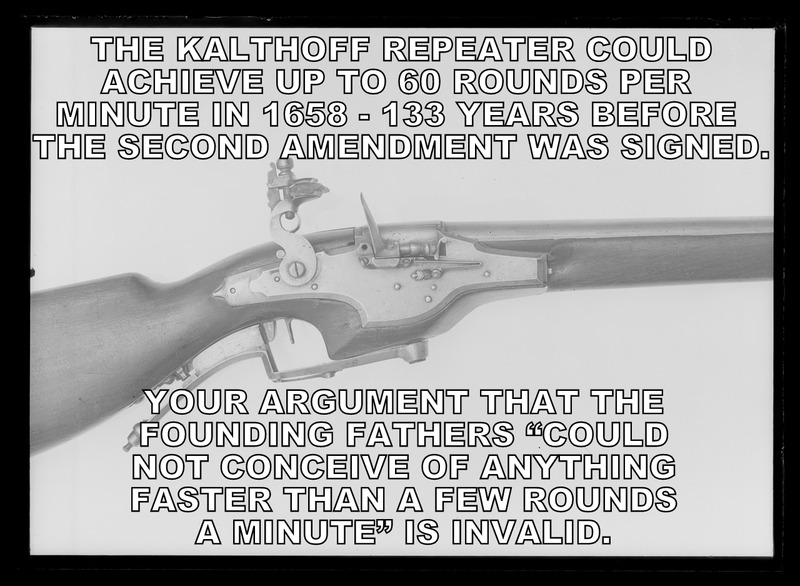 Make no mistake, the Kalthoff Repeater was a weapon far before its time, but it still existed before even the Founding Fathers themselves, much less the Second Amendment. A similar firearm design, dating back to 1690, and probably having been made in the American Colonies before the Revolutionary War, was the Cookson Repeater which was based on the Lorenzoni System. The latter was developed in the early 1600’s. For Heaven’s sake, Joseph Belton offered his repeating flintlock design – employing superposed loads, much akin to the modern MetalStorm system – to the newly-formed Continental Congress themselves in 1777, meaning that, yes, the Founding Fathers were very much aware of rapid-fire firearms. If we expand the concept from “single-barrel and man-portable” to any possible firearm-like device, there are always the Ribauldequin in all its various forms (dating to 1339) and the Puckle Gun (1718). So either the “gun control” extremists in question are calling the Founding Fathers woefully ignorant men who were completely unaware of technological advances that preceded them by centuries, or the “gun control” extremists themselves have no idea what they are talking about. … Yeah. There really is no doubt, is there?